Exploring the careers of five influential women writers of the Restoration and eighteenth century, Catherine Gallagher reveals the connections between the increasing prestige of female authorship, the economy of credit and debt, and the rise of the novel. The "nobodies" of her title are not ignored, silenced, or anonymous women. Instead, they are literal nobodies: the abstractions of authorial personae, printed books, intellectual property rights, literary reputations, debts and obligations, and fictional characters. These are the exchangeable tokens of modern authorship that lent new cultural power to the increasing number of women writers through the eighteenth century. Women writers, Gallagher discovers, invented and popularized numerous ingenious similarities between their gender and their occupation. The terms "woman," "author," "marketplace," and "fiction" come to define each other reciprocally. 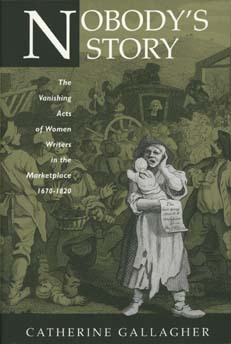 Gallagher analyzes the provocative plays of Aphra Behn, the scandalous court chronicles of Delarivier Manley, the properly fictional nobodies of Charlotte Lennox and Frances Burney, and finally Maria Edgeworth's attempts in the late eighteenth century to reform the unruly genre of the novel. Catherine Gallagher is Professor of English at the University of California, Berkeley. She is the author of The Industrial Reformation of English Fiction: Social Discourse and Narrative Form, 1832-67 (1985).